Will it has made it through the editing process and now I just have to work a few details out with the publishing company Treering.com, then it is ready to be bought and published! What you ask? My book of course I will be officially a published writer! 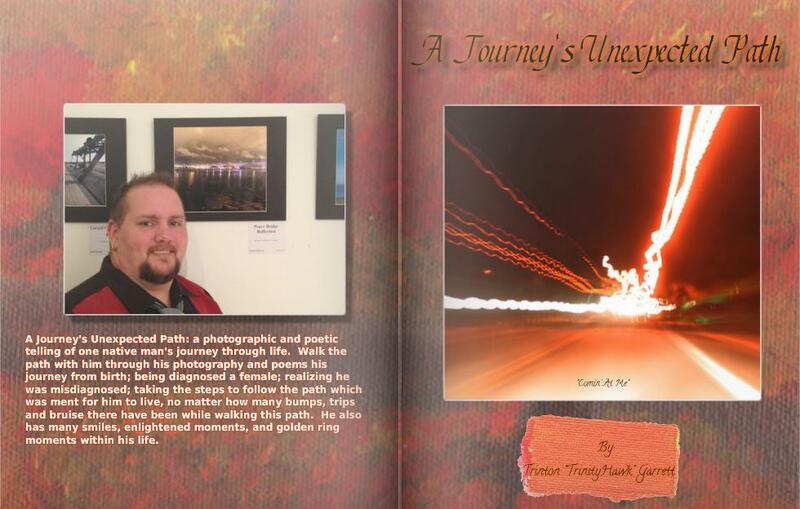 “A Journey’s Unexpected Path” is being a photographic and poetic telling of my journey though life from my birth; to being misdiagnosed as a female at birth; realizing this misdiagnosis and taking steps to follow the path that I was meant for me to live, no matter how many bumps, trips, or bruises there have been along the way. I have also have had a lot of smiles, enlightened moments, and golden ring moments with in my life. Each book will be $20.00 to be purchased, for full page, full color photographs with accompanying poems on each page to guide you through my life’s path to where I am today. Author From The Beak of a HawkPosted on 04/18/2013 04/18/2013 Format ImageCategories Art, Computer Painting, Digital Art, meditation, News, painting, Photo Manip, Photography, spiritualTags art, artistic, autobiography, Awaken, book, buddha, Buddhism, Buddhsim, computer, Computer Art, computer painting, Daily, digital art, edit, Editing, Enlightenment, Enlightment, exciting, Four noble truths, imaginary, imagination, inner self, Knowledge, life, meditation, moved, Multimedia, Multimedia online art, Nobel Truths, photography, photos, poems, poetic, poetry, poster, publishing, spirtulism, Suffering, tree ring, TrinityHawk Photography, Truth, writingLeave a comment on Exciting Things In the Works!! worked over 61 hours in a week and half. Today I put in unscheduled hours at the Gallery and I am working on a graphic design for Seven Chances organization. (http://sevenchances.org). They hired me to design a ticket for their Mad Hatter wine tasting and tea party event in May. Attached is my first draft of that ticket that I am designing. What is your thoughts on my design?